Were there real pirate flags? Yes. They were not ancient myths or legends. Pirate flags were not introduced in pirate movies! Pirate flags were not the figments of imagination from writers like Robert Louis Stevenson who wrote Treasure Island. Pirates flew real pirate flags. The real pirate flags were customised for a specific pirate captain and crew such as the real pirate flags flown by Blackbeard and Calico Jack Rackham. Every pirate ship wanted to fly its own version of a pirate flag. 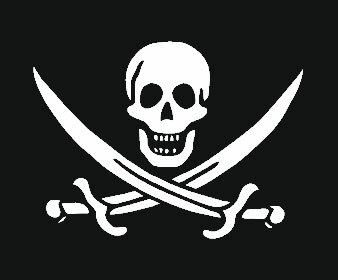 The most famous of the pirate flags was the 'Jolly Roger' but there were many other different designs and pirate flags. Flags were used by legitimate sailing vessels. During the great age of exploration it was imperative to be able to distinguish enemy ships from friendly ships. 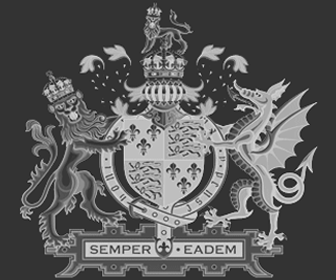 The Elizabethan English ships sailed with flags showing the National emblem such as the Tudor Rose whilst the Spanish ships were distinguished by Catholic crosses. The history of flags developed and National flags were adopted. Pirates had their own Code of Conduct and their own traditions. Adopting their own pirate flags was a natural progression in the pirate culture and history. The pirate flags were used to wage 'Psychological warfare' on their enemies. Pirate flags were designed to threaten, intimidate and spread fear & dread amongst all that encountered the pirate. Pirate flags history was an important element in building the fearsome reputation of the pirate vessels. The background colors of real pirate flags were either red or black. 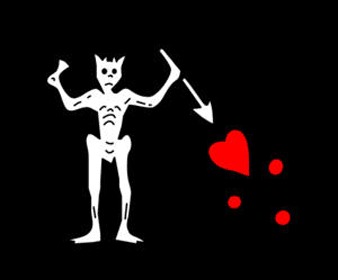 Although black is most associated with pirate flags, the very first pirate flags were in fact red. The colors of red and black both held symbolic significance. The early pirates sailed under the Red Flags. The color red in pirate flags symbolised bloodshed. Red pirate flags also symbolised a warning. There are a number of theories about the origin of the Jolly Roger name - the truth is that its probably a combination of most of them. The pirate flags of John Avery (AKA Every, Long Ben) the included the skull and crossbones. The skull was further embellished with an earring and a bandana which was strongly associated with traditional Pirate Clothing. 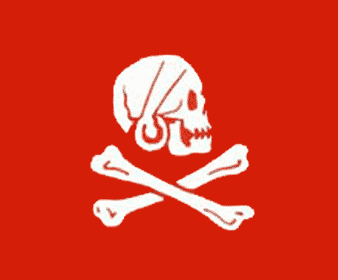 The following picture depicts the pirate flag of John Avery on a red background.